It all started with Walt Disney. In 1927, Disney was winding down production on his Alice Comedies—shorts combining live action and animation—and decided to produce an all-animated series next. There were several reasons for this move. It was economically beneficial: mixing live action into the Alice shorts had been time-consuming and costly. It benefitted storytelling: Disney’s head animator and friend, Ub Iwerks, had been pushing for the opportunity. Finally, it placated the boss: critical producer Charles Mintz was eyeing a distribution option with Universal and preferred an all-animated cartoon. Thus Oswald the Lucky Rabbit was created. The first short, POOR PAPA, was not well received by Universal, mainly because Oswald himself seemed too rough and elderly for their tastes. The short was shelved and Disney sent in a second cartoon, TROLLEY TROUBLES, featuring a slicker version of the rabbit. Ub Iwerks was chiefly responsible for streamlining the character’s look and behavior. This time, the short met with Universal’s approval, was released, and found success. The Oswald series as a whole was off to a fine start. However, some startling changes would occur in the production year that followed. Iwerks had warned Disney in January 1928 that certain “renegades” on his staff had plans of departing, but Disney gave the matter little thought. When Disney went to New York in February, however, to renew his contract with Mintz, he discovered that Iwerks’ concern was very real. Mintz had already begun offering Disney’s animators and gagmen more promising contracts to work at a studio of his own. Mintz wanted control of Oswald, just as he had control of Ben Harrison’s and Manny Gould’s Krazy Kat production house in New York. Mintz wanted Disney as his employee—and to be fair, he had offered promising contracts in the past. Now, though, when Disney requested bigger budgets for the Oswald films, Mintz turned on him. Walt would agree to a budget cut rather than a raise—or himself be cut out of the production scheme. Oswald belonged to Universal, and Mintz controlled the decision-making process. Aggravated Disney declined Mintz’s budget cut and formally disassociated himself from Oswald, leaving New York for Los Angeles on March 13. Disney made rough sketches of a new character—Mickey Mouse—on his return trip. 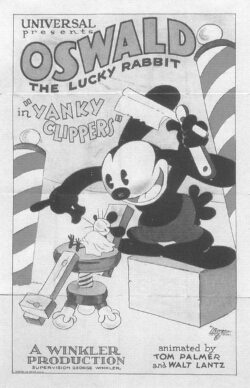 Back in Hollywood, he assigned Ub Iwerks to animate PLANE CRAZY, Mickey’s first cartoon. Iwerks was to isolate himself from the staffers who had signed contracts with Mintz, including Hugh Harman, R. C. Hamilton, Paul Smith, and Ben Clopton. These staffers would complete the remaining Disney Oswalds, then depart for Mintz’s new studio on May 5, 1928. The only artists remaining loyal to Disney were Iwerks and apprentice animator Les Clark. Mintz delegated his brother-in-law, George Winkler, to produce the new Oswalds in Hollywood. Joining the former Disney staffers were a handful of new recruits. Walter Lantz was an unpaid intern from the Mack Sennett comedies, whose brilliant sense of humor soon promoted him to the director’s chair. Isadore “Friz” Freleng had been fired by Disney over creative differences several months earlier, but now rejoined the Oswald crew. Manuel Moreno and Ray Abrams came aboard as inbetweeners, soon to be joined by Fred “Tex” Avery as an inker and painter. The first Mintz Oswald, short, HIGH UP, made its theatrical debut on August 6, 1928. Disney, meanwhile, had gained an edge on Mintz. Mickey Mouse’s third short—STEAMBOAT WILLIE, released November 18, 1928—revolutionized the industry with its synchronized sound. Mintz and Winkler had a tough act to follow; but from February 1929, they made a smooth transition to the new medium, beginning with HEN FRUIT. Winkler and Mintz enjoyed their success, but former Disney staffers Hugh Harman and Rudolph Ising had other ideas. They hoped to edge out Mintz just as Mintz had edged out Disney, proposing to Universal president Carl Laemmle that they produce the Oswald films on their own. This time, though, the plan backfired. Universal not only rejected Harman’s and Ising’s offer—they terminated the Winkler contract, preferring to have Oswald produced directly on the Universal studio lot. Laemmle would appoint Lantz to produce the new shorts, beginning with RACE RIOT (September 9, 1929). Unfortunately, the Winkler Oswald shorts are hard to find today. Some have surfaced in private collections, others in major film libraries, but many are still scarce if not lost. Several of these shorts have been misrepresented in research at times—often as Lantz creations or overlooked entirely. Now, with the aid of original copyright synopses and film review journals, it is our privilege to bring you an in-depth look at these rare cartoons.